Social gatherings featuring experts from the food community. This is the sixteenth event in this Food Talks series! Come join us to meet and mingle with other foodies, and to hear some enlightening speakers from the food community. 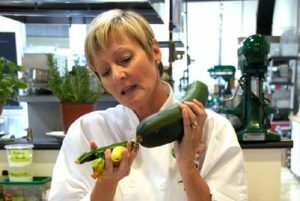 Barb Finley is the Executive Director and founder of Project CHEF: Cook Healthy Edible Food, a non-profit society that runs elementary school and community programs. Project CHEF has taught more than 15,000 children and their families about wholesome food choices and how to make them. Barb is an educator and chef and has taught with the Langley and Vancouver School Districts, UBC Faculty of Education, Dubrulle Culinary Institute and Northwest Culinary Academy of Vancouver. A passionate advocate for teaching children how to cook, she has developed culinary programs throughout Greater Vancouver. Barb’s work has been honoured by receiving the Governor General of Canada’s Meritorious Service Medal (2018), Canadian Foodservice Professionals Community Leadership Award (2016), the BC School Superintendents Award of Recognition for contributions to public education (2013), the Les Dames d’Escoffier Debra Van Ginkel Award (2008) and a nomination for the YWCA Woman of Distinction Award (2011). Barb is a member of Les Dames d’Escoffier, BC Chapter and is a past Trustee with the Canada Post Foundation for Children. Parinya Loptson was born in Thailand and finished university to become a school teacher, teaching elementary school (grades K to 9). Growing up in a small village, far from the city, food and cooking is such a large part of the culture that she grew to love preparing meals for the family, even though it was her responsibility as the oldest child. She left Thailand in 1998 and moved to Edmonton where she attended the Northern Alberta Institute of Technology and graduated with a diploma in computer programming. She moved to Smithers, BC with her husband in 2003 where they had 2 kids. They then moved to Langley in 2007 and have been there until now. Parinya worked at several jobs since coming to Canada and did well at them, but she wasn’t really satisfied with any of them. One day she got this idea in her head to open a Thai restaurant, and she couldn’t get rid of it – it just kept growing. After planning for almost a year, they opened the original Ban Chok Dee Thai Cuisine in Langley in 2009 and moved to the current Langley location in 2012. In 2016 they opened a second location in Maple Ridge. 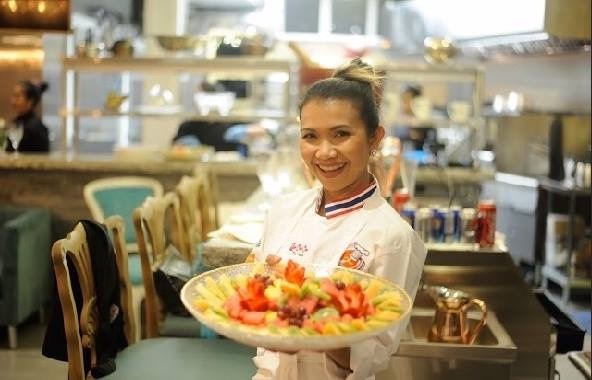 In 2018, they have opened a Thai cooking school in Langley which is also a venue for private functions, meetings and special dine-in events. The cooking classes cover a variety of topics and are suitable for both adults and children. 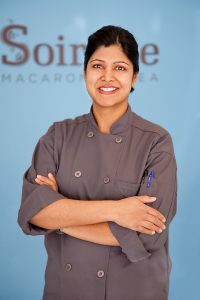 After studying under a Cordon Bleu chef, Lynda worked as a chef and an executive chef for the Sequoia group for 25 years. In her career, she prepared meals for Bill Clinton, Boris Yeltsin, and a princess of Thailand. As well she has been a consultant chef for Donald Trump. She has mentored countless chefs over the years who are now running their own restaurants or working in leading kitchens around the world. She is currently the co-owner with her husband of the iconic Argo Café. Having lived in different parts of the world and having grown up in the diverse, multicultural community of her native Malaysia, Shobna brings a unique twist to her creations and offerings. In her teenage years, she moved to New Zealand where she completed her Bachelor of Engineering degree at the University of Auckland. It was during this time that she began to fall in love with baking. 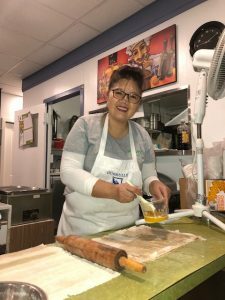 After working in the engineering field for a few years, she discovered that pastry arts was her true calling. This prompted her to leave her comfort zone and migrate to Canada with her husband in 2003. She attended Le Cordon Bleu in Ottawa and graduated at top of her class with Honours. Shortly after graduation, she staged at the Fairmont Chateau Laurier and took on a junior position at Cakes by Tatiana in Ottawa, where she honed her cake decorating skills. She then worked at 3 Tarts Bakeshop where she produced thousands of handmade tarts and started to truly understand the meaning of production! She then went on to be the Pastry Chef at Stoneface Dolly’s in Little Italy, Ottawa where she oversaw bread and dessert production for the restaurant. In 2006, Shobna and her husband decided to move to Vancouver, where she accepted a position as Pastry Chef at Cupcakes on Denman. With years of experience under her belt, she began to develop her own unique vision a magical jewel-box pastry shop. In 2010, after her son was born, she attended BCIT to work on her business plan in order to bring her vision to fruition. Soirette was created in 2012 and has since grown to become a favourite among Vancouverites, supporting various local charities along the way. Together with her talented team, she uses the finest of ingredients to create macarons and cakes which are a treat for the senses. When the wine scene began to heat up in the eighties, Dana joined her father’s import wine agency. This work enabled her to develop her skills and gain experience, providing a solid background for her subsequent career in the wine and food industry. In 2002, she secured a position as Regional Manager with Robert Mondavi. Three years later she started her own consulting business, focusing on the food and wine industry. Dana enjoys the multifaceted nature of her work, which includes planning events, media relations, strategizing with clients, and communications. She has cultivated valuable relationships with liquor boards, trade and media across Canada, allowing her to achieve maximum exposure for her clients and their products. Dana has worked with Wines of Argentina in Western Canada since 2007. Among many projects she helped organize the highly successful 2010 Vancouver Playhouse International Wine Festival, at which Argentina and New Zealand were co-theme regions. Dana has contracted with many wine regions including British Columbia Wine Institute, Wines of South Africa, Wines of Argentina, California Wine Institute, Wine Australia, Sonoma Country Vintners, Napa Valley Vintners, New Zealand Wine Growers and the Washington Wine Commission. On projects including Primum Familiae Vini Vancouver and Whistler, Michel Rolland cross Canada media, liquor board and trade tours, Cornucopia; Whistler’s Drink & Food Festival, Dish ‘n Dazzle, Vancouver International Wine Festival and more. Dana is a member of Les Dames d’Escoffier, is Executive Director of the BC Hospitality Foundation and is a certified fitness instructor. 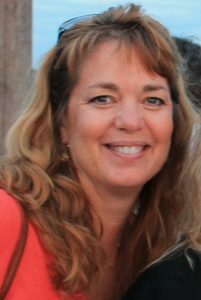 When not volunteering or working, she enjoys travel, spending time with family, friends, her husband Dean and enthusiastically pursues outdoor activities such as golf, biking, and hiking. Enjoy appetizers and a welcome cocktail, followed by our wonderful line-up of all women speakers who will talk about themselves and our theme. There will be a Q & A where you will have a chance to ask questions and engage with the speakers along with a chance to mingle and network with the speakers and guests afterwards. Note: ALL Tickets must be purchased in advance online. All ticket sales are final. No exchanges or refunds; however you are welcome to transfer the ticket to another person for the same event if you notify us in advance with name (s) of who will be attending in your place. Event produced by CMI Chat Media Inc. This entry was posted in Upcoming Events and tagged Dockside Lounge, Education, Food Talks, Granville Island Hotel, Vancouver Foodster Event by foodtalks. Bookmark the permalink.